A 20" LCD Screen vs a 20" CRT Monitor - Which is Bigger ? As kids, we are often asked what would weigh more - a kilogram of cotton roll or a kilogram of stone - as you probably guessed, both would weigh the same. The same logic may not apply to display sizes of computer screens. 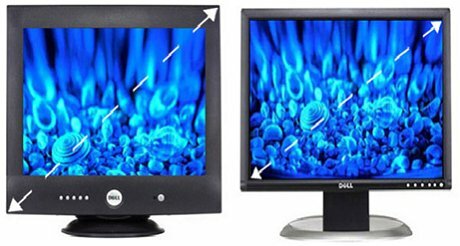 The viewable area of a 17" LCD monitor is not the same as that of a 17" CRT monitor or a 17" TV screen - it is generally much larger. That's because the LCD screens are measured in a different way than CRT screens. Though both screens are measured diagonally, the plastic case surrounding the monitor screen is included in the measurement for the CRT. Therefore, the actual viewable area is at least an inch less than the stated size of the screen. LCD Display size refer to the actual screen dimensions or the viewable area and do not include the plastic edges.